Honestly I have no idea if this review is even going to be coherent, because if I could give this book all the stars in the sky I would. After I finished The Goblin Emperor I felt so lost. The story was over. There was nothing more to be said. And though I'd finished the story only seconds before I already missed the world and all of the characters in it. I usually love standalones, but for the first time in a long while I found myself mourning that The Goblin Emperor isn't the first in a series. 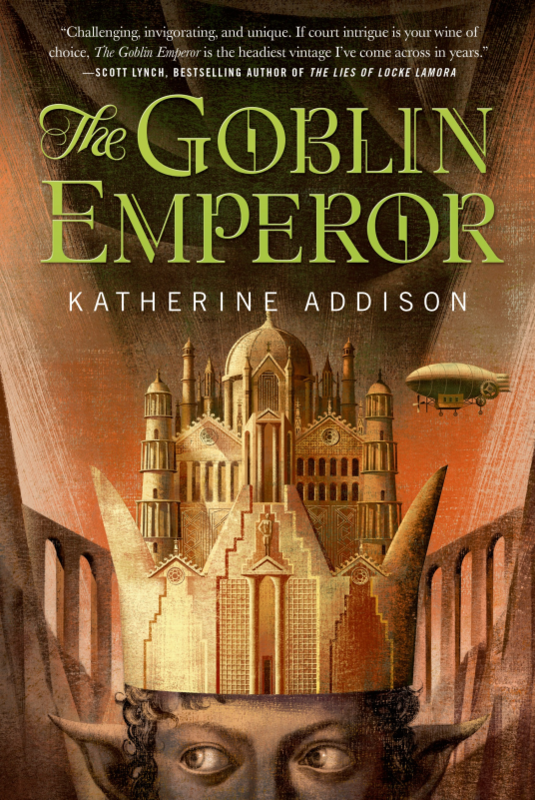 If you're a fan of sprawling, epic fantasies with quests and dragons and sword fights and the whole world being at stake, then The Goblin Emperor might disappoint you. I say 'might' because I don't see how this book could disappoint anyone. Rather than being a 'typical' fantasy book, The Goblin Emperor is a story of politics and courtly intrigue that also just happens to be a fantasy novel. I understand that you might see the word 'politics' and think 'boring', but it really isn't. If you're a fan of history or historical fiction then I'd say this book is right up your alley, especially if you don't tend to stray into fantasy but would like to. I'm only just getting back into high fantasy and, as a big history nerd, I love a bit of political intrigue, so this book was perfect for me. The writing style took a little getting used to at first, but after a few pages I had no trouble whatsoever, and sometimes the names could be confusing - luckily for me, however, I read this on my kindle, so whenever I wasn't 100% sure who someone was I just had to tap on their name and remind myself! So, why isn't this book boring? For one thing the entire world Katherine Addison has created is so rich I still can't quite believe it's not real, and for another... it's the characters. I don't think I can put into words how much I fell in love with Maia, the fourth, half-goblin son of the late emperor who is suddenly thrust onto the throne after the deaths of his father and his three older half-brothers. It was so refreshing to read a book about a character who is a good person, but is still a believable person. Poor Maia is thrust into kingship with no idea whatsoever what he's supposed to do or whom he can trust, but throughout his many trials he stays true to himself and I love him for it. He's a little sweetheart and I have never wanted to befriend and cuddle a character more. And then there are characters like Csevet, Cala, Beshelar, Csethiro, Vedero, Kiru, Telimezh and Idra, so many characters to fall head over heels in love with. I want to hold a dinner party and invite all of them because they're all amazing and I really hope Katherine Addison writes something else about these characters, even if it's just the odd short story. Basically I could gush about this book forever, and I'm probably going to gush about it on my blog for the rest of the year and every year after. It's that good. In fact it's so good that as soon as I finished it on my kindle I ordered myself a pretty hardback edition, because I need a copy of it on my shelf. Please, please, please just read it. I love that cover! I tend to really enjoy novels with political elements and court intrigue, so I will have to add this one to my list. Great Review!